When your toddler wakes up around 5:00 A.M., it turns into a good morning to walk on the beach. It was too cloudy to see a good sunrise, but we still enjoyed our walk before the rain began. The One Way sign amused me. I guess you have to have some signs when people can drive on the beach. I snapped a picture of our hotel too. We visited the USS Lexington on our trip to Corpus Christi. Alex, Mom and I stayed on the main deck, which was more toddler friendly. Dad and John made it up to the flight deck and down below, which were not conducive to strollers. Alex still had fun, and we can go back again when he is older. We were happy to have my aunt and cousin visit earlier this month! When you put eight toddlers in a room together all day, someone inevitably gets bitten. Apparently my son gets bitten when struggling with another child over a book. Yep, a little geeky. After school today we discussed waiting until the other child is all done before taking the book. Some kids have a blankie, lovey, or favorite stuffed animal. 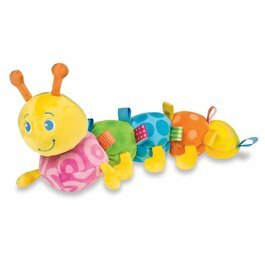 Alex does not have one yet, so I thought that he may want to sleep with his stuffed caterpillar. Nope! For the last two nights, the catepillar has been thrown out of the crib. "When Alex noticed a visitor at the door, he flirted with her by turning his head away and then turning back around and smiling, over and over." My 16 month old is a flirt, and John and I have also witnessed this. Should I be worried?! 1. I looked out Alex's window yesterday to see Paddy drinking the water off of the hot tub cover. Yes, we give Paddy water, but she prefers outside water. What is she going to do when we finally remove the hot tub? 2. Frida is hanging out on the deck. 3. John and Alex are reading Linux magazines. One of my co-workers moved to Texas last fall. Not too long ago he asked me if Texas is home yet. I paused before I answered. He took my pause as a "no" because I had to think about it. That conversation and thoughts of how I define home popped into my head today. While I have made a life for myself here in Texas, it is hard to be away from a lot of my family. I am still very much defined by where I grew up, but I have not been back to the Buckeye state in over 18 months. Texas is where we purchased a house and made it our own. Texas is where my son was born, and we have no plans to move. We have lived in Texas for 6 years now, but how much of a factor does time play into this definition? Is Texas home yet? 1. Real Red, Brilliant Blue, Old Olive, Whisper White and Tangerine Tango cardstock from Stampin' Up! 3. Printed "Look Who is Turning" from My Digital Studio from Stampin' Up! and by doing a search on Split Coast Stampers. What a difference a month makes! Alex is now walking and talking. One of Alex's daycare notes this week said, "Alex walked across the room carrying a toy bucket - his walking is improving!" Alex can say a few words, but not consistently. We've heard him say ut-oh, bye, dada/daddy, and mo (more). At school he said stop. He can also do the signs for more, eat, dog, and stop. He waives bye, blows kisses, and claps his hands when you finish singing a song. Right now he is fascinated by John's computer mouse.